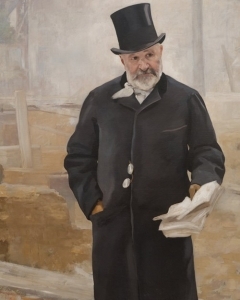 Different articles of dress for different tasks and occasions characterized the Victorian man’s attire, and therefore men in Whitechapel would have dressed according to their status and duties within society. Most city men would wear a close fitting shirt, usually with cuffed sleeves. Small, close-lying collars topped vertical buttons or laces that stretched to the man’s midsection. Neckties were usually made of silk and came in varying shapes and patterns, including the English square, the silk puff, and the silk imperial. 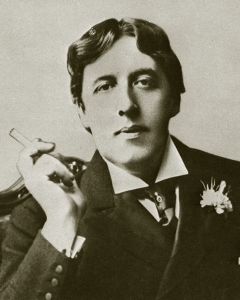 Over the shirt, men would commonly wear “waistcoats” or vests. These were the most varied parts of a Victorian man’s wardrobe. 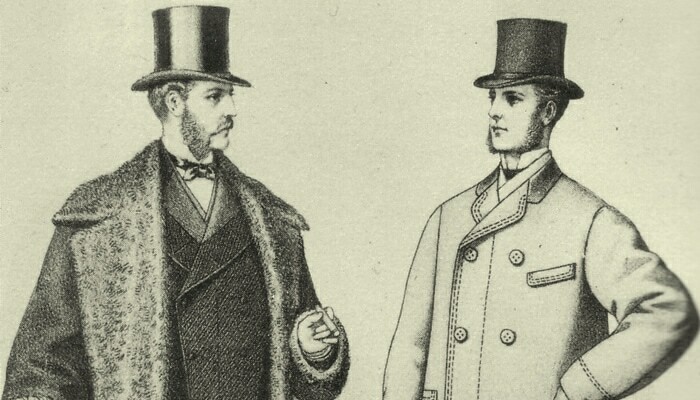 After 1850, the double-breasted waistcoat became more stylish. Lapels were usually “notched” meaning split into different levels. Waistcoats also usually had a pocket on either side of the buttoned center in which men could store handkerchiefs and pocket watches. Lastly, a belt or tie at the back of the waistcoat would keep it fitting tightly around the man’s mid-section, accentuating his shape much in the same way stays and corsets did for women of the time. Trousers fell loosely to the ankle and were usually held up by a pair of elastic suspenders or “braces”. The pants had high waistbands and fit tightly at the top, loosening down toward the ankle. They were made in dark colors or with subtle plaids and muted colors like light gray or light brown (or “fawn”). Men wore boots that were fastened either with buttons and hooks or with laces. Some of these boots had elastic or “spring” siding to help make putting them on easier. Boots typically had pointed, narrow toes with detailing at the edges, at least for the more well to do. 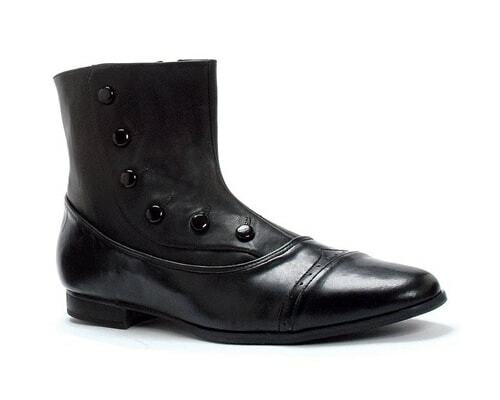 Many men would also decorate their boots by covering them with spats. Socks, or “hosiery”, came with ribbed tops and almost as many patterns as current male dress socks. 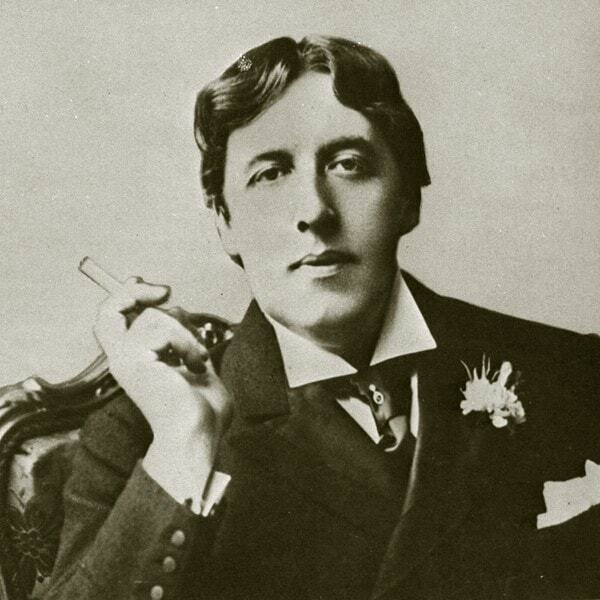 Men wore brown leather gloves, sometimes black, that were buttoned at the wrist. Gloves were customarily worn at all times, but gloves intended for winter use were often lined with fur. Watch chains were also common, and worn across the waistcoats. 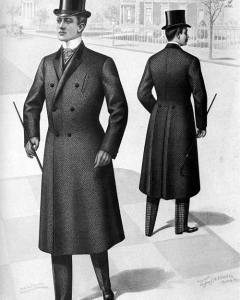 Longer overcoats were as popular for men as they were for women during the Victorian era. Many of these close-fitting coats extended to the knee, especially during the fall and winter months. 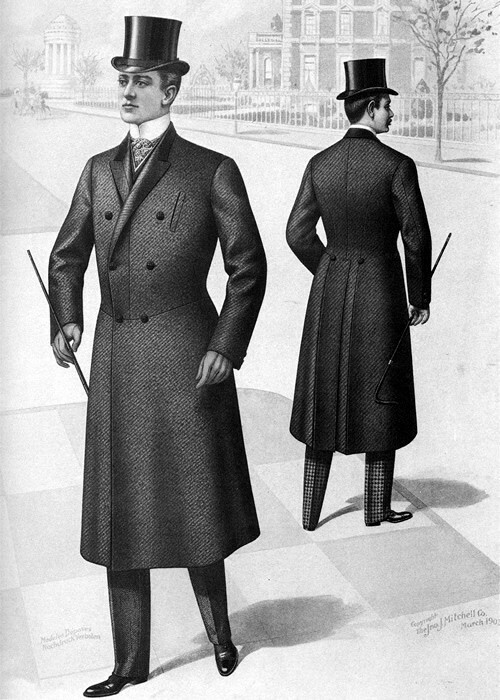 Men’s long coats did not have the same tailored look and cinch at the waist as women’s coats. Suit jackets could be shorter and cinched, however, particularly when worn during warmer seasons. 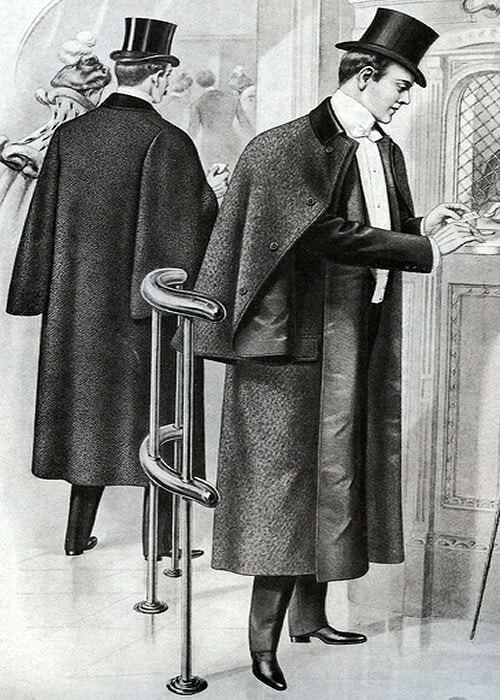 These were called “sack coats” and are a precursor to the suit jackets that men wear today. 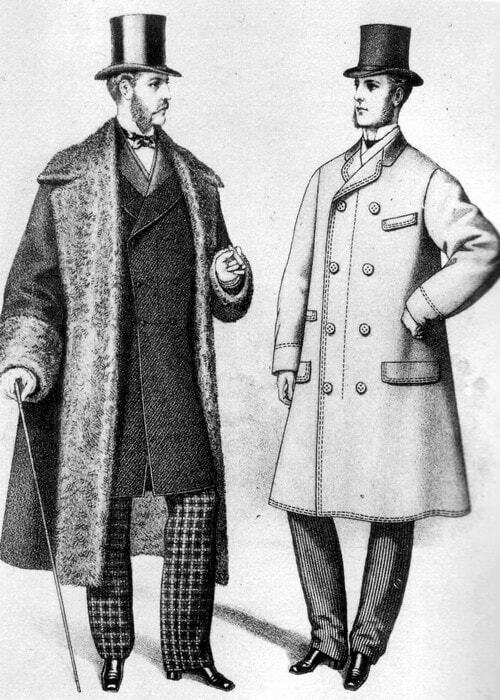 Fashionable shorter coats included the high-buttoning Morning Coat (or cutaway coat), while longer ones included the Ulster, the old-fashioned Frock Coat and the Chesterfield. 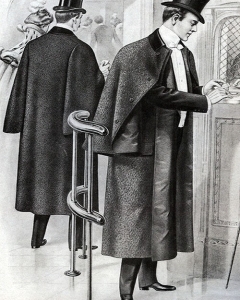 Darker and more somber colors were usually favored for daily wear, though smoking jackets and indoor lounge attire could feature flannel and angora dyed brighter colors. 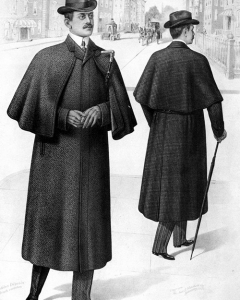 Most often associated with Sherlock Holmes, the inverness cape is a weatherproof outer coat which was often worn in 1880s London. The inverness cape is a sleeveless outer garment, which was typically worn in 2 styles: a more formal version where the topcoat is finished with short lapels and the capes are set back behind them, as well as a less formal “coachman's cape” which had no lapels. Mrs. Long, who claimed to have seen a man speaking with Annie Chapman minutes before her murder, described him in the following manner to coroner Baxter during the Chapman inquest. The legendary Ripper costume is much like that of the typical Victorian man, but can come in several different iterations. The most famous depiction often includes him wearing an Ulster coat cut below the knee or just over the ankles. 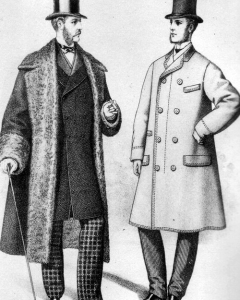 These coats included a short cape that fell below the scapula and separated in the front over the coat’s fastenings; the collar itself would be small and lie close to the neck. 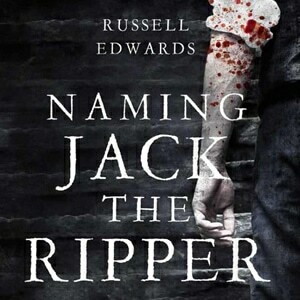 Often the Ripper is depicted as wearing a top hat in spite of Mrs. Long’s claim that he was wearing a deerstalker hat. 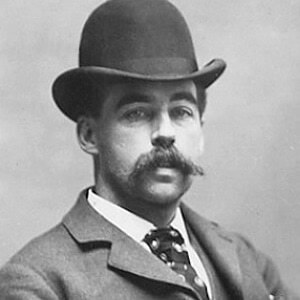 Witnesses called on in the Elizabeth Stride murder claimed to have seen a man was wearing a very long black coat. One witness, Israel Schwartz specifically said that he wore a wide-brimmed, black felt hat. George Hutchinson was one witness who got a clearer view of someone who could have been the Ripper. 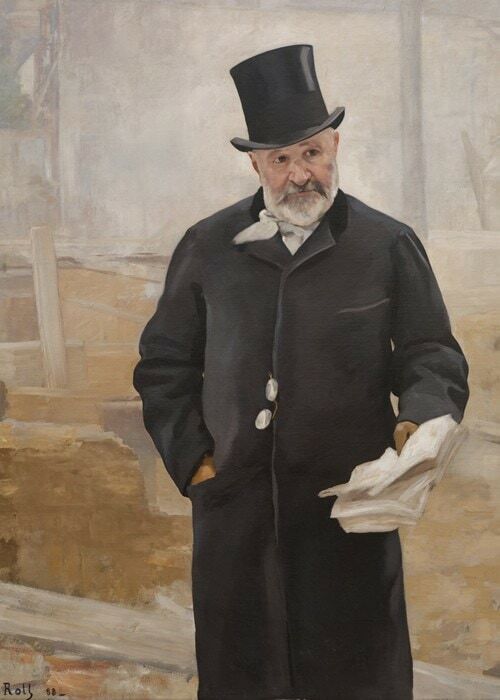 He describes him as having worn a felt hat, a long dark coat (again), a black necktie, and dark spats over boots. He also supposedly carried a parcel in his left hand, though not the black Doctor’s bag that populates Ripper caricatures. The idea of the Gladstone bag was generated from Dr. Philips’ “Burke and Hare” theory that the Ripper was harvesting organs to sell to medical schools. 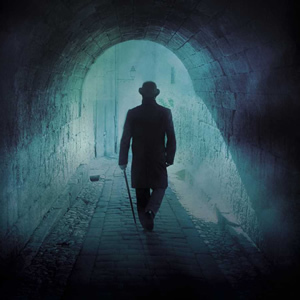 Carters and workmen of Whitechapel, such as the ones who discovered victims such as Polly Nichols and Annie Chapman, did not dress precisely the same as the well to do. 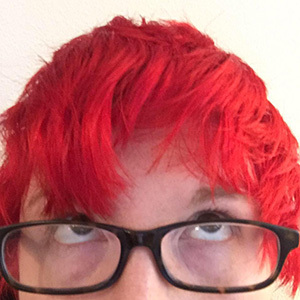 The basics, however, were quite similar. Men wore work shirts with small collars and buttons or ties to hold them together. Waistcoats or vests, though not as elegant, could be worn over these work-shirts as well. They wore practical trousers made of sturdy fabrics like cotton or moleskin along with leather work-boots. Lower class men often wore big plaids or checkers in vivid colors, while these garish colors and patterns were only worn by upper class “dandies”. Consider, also, the working classes of men who were possible Ripper suspects: namely the slaughterhouse workers and butchers of East London. In that case, the normal workman’s costume would suffice, but covered in a leather apron soiled with blood.